Gay rights campaigners from the Borders were among around 60 people who took part in a peaceful protest in Dumfries on Monday evening. They were there to voice their opposition against Angus Buchan, an evangelical preacher from South Africa known for his strident views on homosexuality. As reported last week, Pastor Buchan had been due to address an audience in the Volunteer Hall, Galashiels, on the same evening as the guest of the Tweedbank-based Hope Church. But after complaints from the Borders LGBT Forum, hall owners Live Borders cancelled the booking, claiming the event had “the potential to cause public offence”. 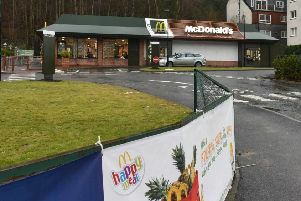 There had been speculation another Borders venue would be found by his hosts, but Pastor Michael McLeister of Hope Church ruled this out “for the sake of the gospel, peace and relationships in our community”. At the weekend, however, another evangelical organisation, the Lighthouse Church in Dumfries, stepped into the breach and announced Pastor Buchan would preach in its Maxwell Street church instead. Before embarking on his first visit to Scotland since 1991, Pastor Buchan, 69, whose late parents hailed from Aberdeenshire, spoke of his “great sadness” at the Galashiels snub. “On the virtual eve of my departure ... I have come under the most severe attack and resistance I have ever experienced in my life since becoming a Christian in 1979,” he told his supporters. “Effectively, the gay rights movement has banned me from preaching the Gospel in Galashiels. “I am accused of being a homophobe, among other unsavoury things, but all I am doing is preaching the undiluted word of God, the Bible, in its entirety, not compromising one word. Around 130 people attended Monday’s event in a former Benedictine convent chapel in Dumfries as the protesters gathered in the street outside for what organisers described as “a celebration of love”. Inside the chapel, Pastor Buchan referred to the demonstration. “Those people at the end of the road, they are lost, they need love, they need Jesus,” he said, adding: “Galashiels chased me away – Dumfries has welcomed me”.